I woke up to the sound of pre-dawn roosters and hazily watched a small dark blob drop from from the vaulted thatched roof ceiling onto an otherwise spotless tile floor. Was this jet-lag or had I really just seen poop fall from the sky? Indeed, my eyes were not deceiving me. Evidently a pair of geckos live on the woven bamboo roof of my tropical abode and creatures of habit that they are, they go to the bathroom in the exact same spot every day. I am in a tropical paradise. I have been in Bali for 24 hours and it really does feel like this verdant island is itself living and breathing all around you. From the guidebooks and hype, I had imagined Bali, and specifically Ubud, to be a lush, green hippie haven. In reality, it is much more interesting than that. Certain elements evoke India for me, like the flagstone covered sewers, the ubiquitous use of spices, and the careening and incessant motorbikes. The landscape reminds me of a cross between Goa’s relaxed island vibe and Kerala’s drenched rice fields and expansive palm trees but it is most primarily uniquely Balinese. 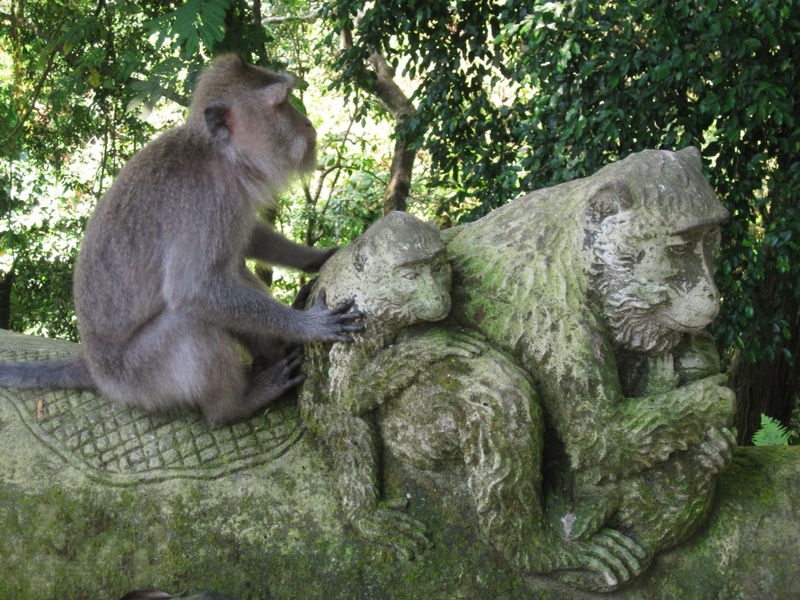 The largely Hindu island expresses the religion somewhat differently from what I’ve encountered in India – people in both places typically make incense-scented morning offerings to the gods, but the frangipani flowers and bamboo baskets used here are unique and the stone carved figures with eyes bulging and fangs bared are distinctly Balinese. Family and religious ceremonies are at the heart of life here, and each family lives in a compound with a beautifully ornamented temple and a small building for each family unit. The architecture is ornate, with red tiled roofs that curve up at each corner, often with small stone carvings. 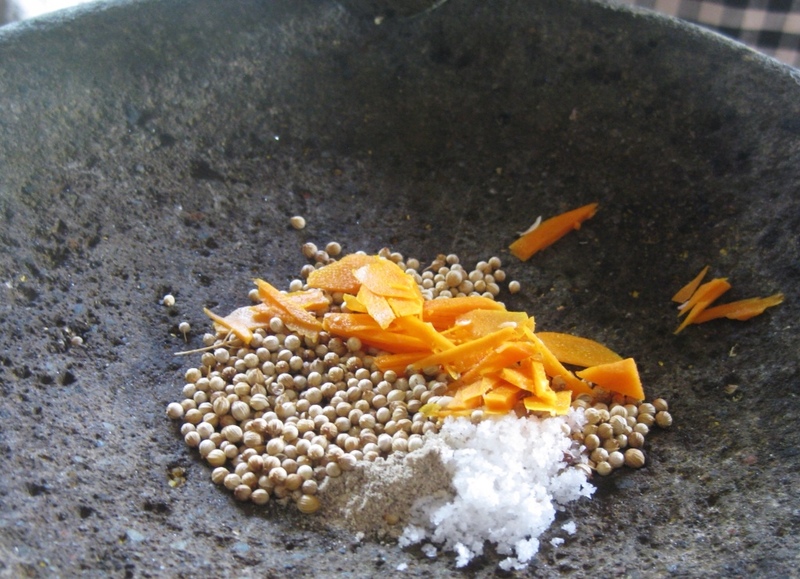 The food is distinct from what traditional Hindus eat in India – meat is incorporated freely into the diet here and spices are more mildly aromatic, eschewing the more pungent cumin and garam masala typical of Indian cuisine in favor of vanilla, galangal (spicy ginger), palm sugar, and coconut. 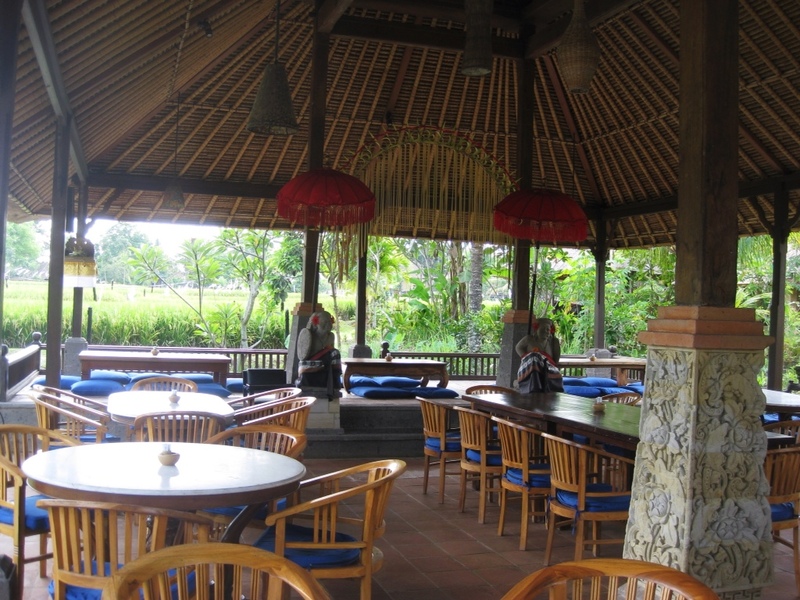 My first meal here was Nasi Campur, or mixed rice, which seems to be the national dish. Much like a South Indian thali, it is a plate of white rice surrounded by a selection of dishes, each prepared differently: vegetables, tempeh, beef, chicken, and a hard boiled egg. 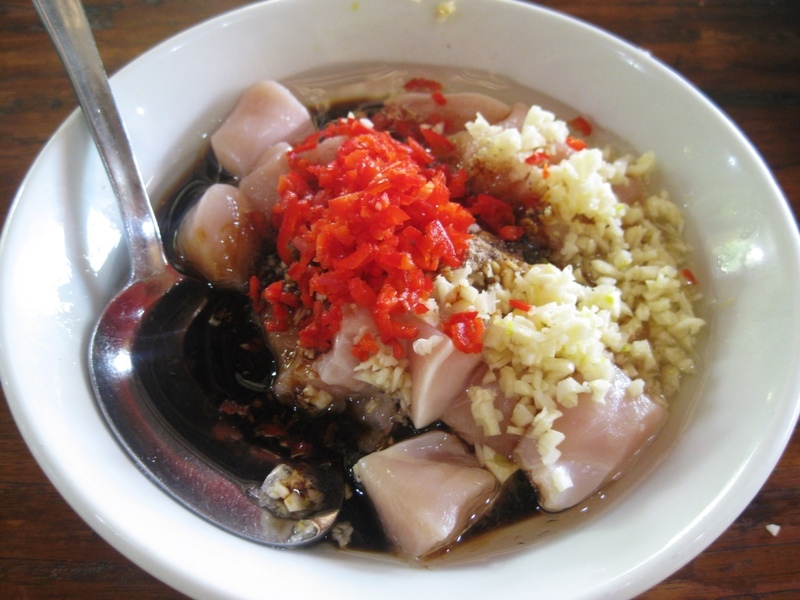 The flavors at the restaurant were pretty mild and could have left me feeling like Balinese food was a bit bland, but luckily the cooking classes remedied the situation, packing a punch of flavor and spice. I got picked up by motorbike for my first class at Laka Leke and we zipped through the monkey forest sanctuary, weaving through hanging palm fronds and careening over rushing streams. When I arrived at the tasteful and peaceful cafe, I watched monkeys jump through the trees as I sipped my “welcome drink” of mixed fruit to the tune of splashing fountains in the surrounding garden. Then it was time for the real work to begin. 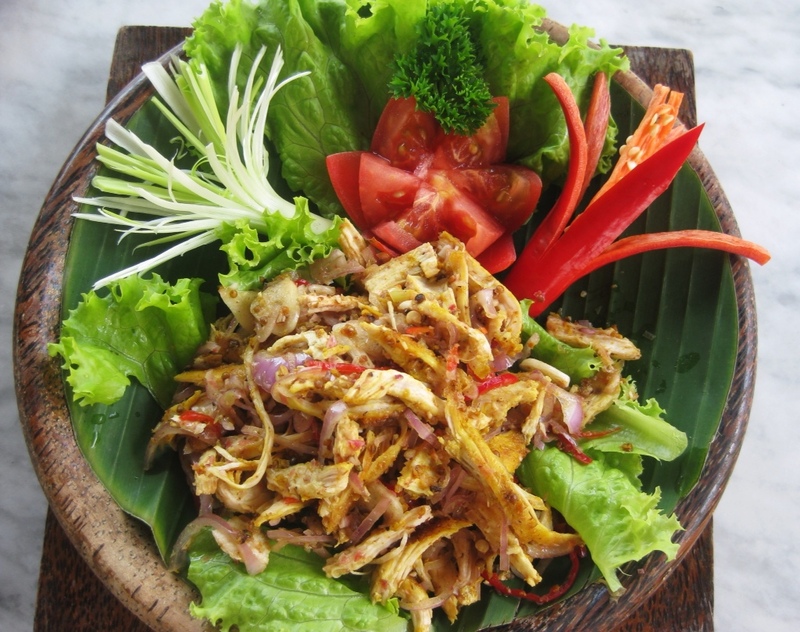 We started with Ayam Panggang Sambal Matah or Balinese chicken salad. 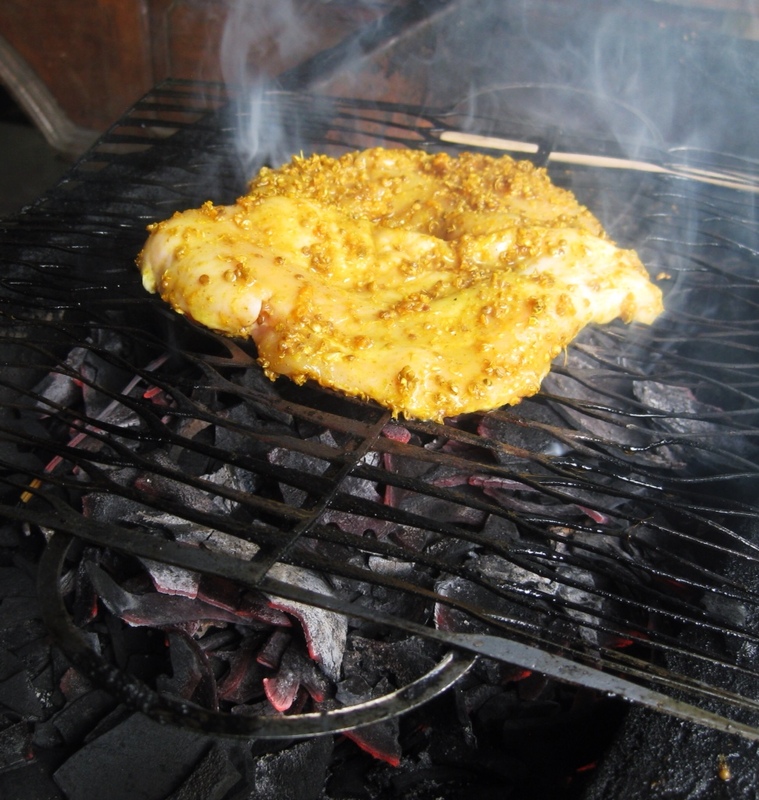 We made this by marinating chicken breast in fresh turmeric root and crushed coriander seeds, then grilling and shredding the chicken. 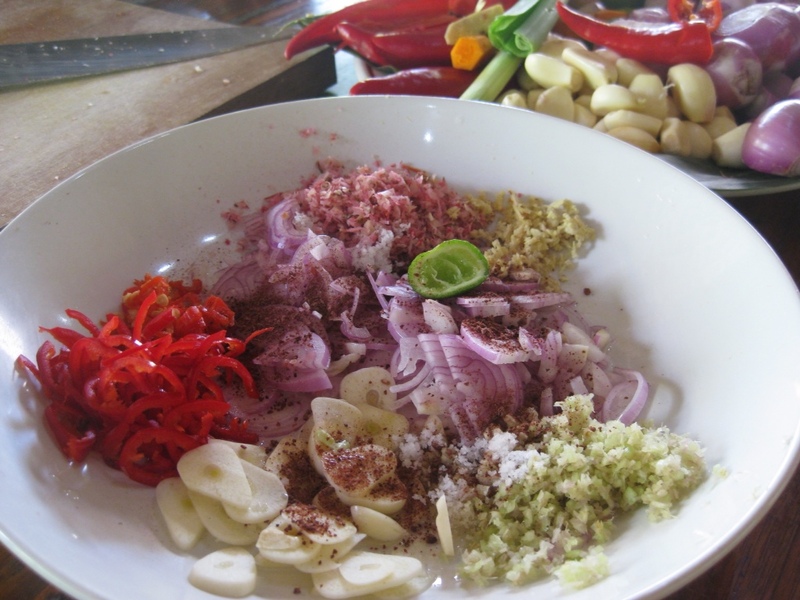 The dressing was a mix of flavors, dominated heavily by ginger but also including shallots, garlic, chilies, shrimp paste, kaffir lime juice, and lemongrass. 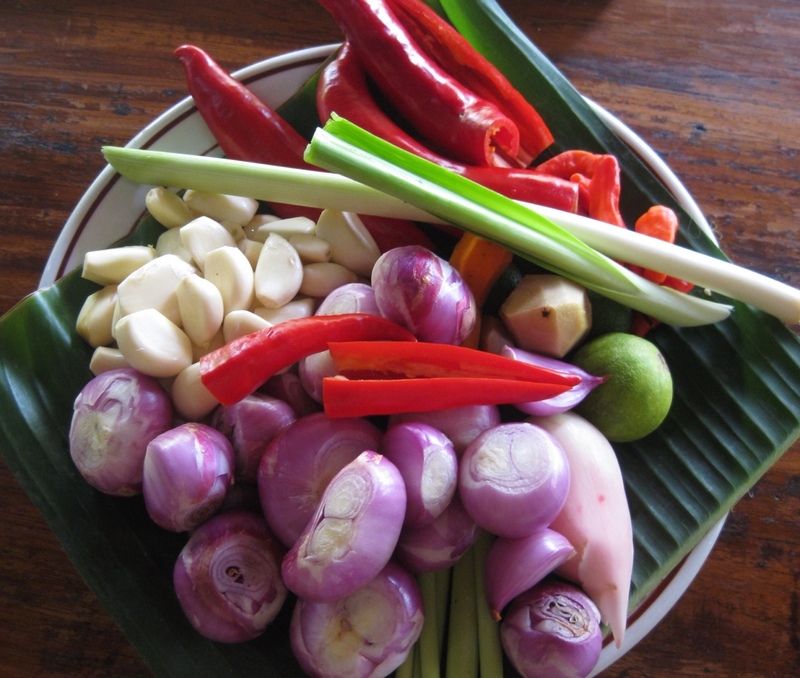 Characteristic feature of Balinese food: lots and lots of chopping! Marinade for the chicken, ready to be crushed: fresh turmeric, coriander seeds, sea salt, and pepper. Fresh turmeric root is orange and turns yellow when cooked or dried. 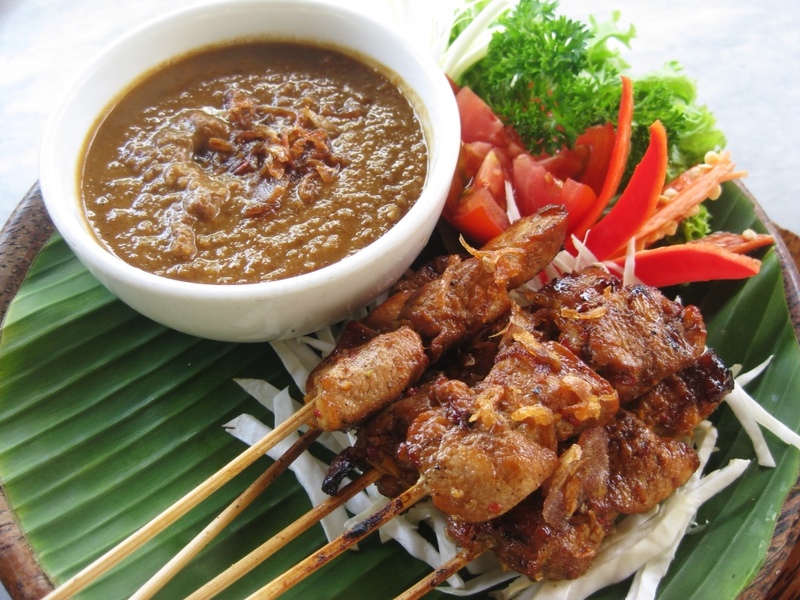 Up next was Sate Ayam with Bumbu Kacang or Indonesian chicken satay with peanut sauce. We cut the chicken into rectangles (better to skewer and cook evenly than pure cubes) and marinated it garlic, sweet soya sauce, lemon juice, and chili. The peanut sauce was a workout – pounding the peanuts with a mortar and pestle and mixing in tomato, garlic, palm sugar, and salt. Luckily, the paste stays good for a couple weeks in the fridge and simply needs to be boiled with lime juice and sweet soya sauce before serving. 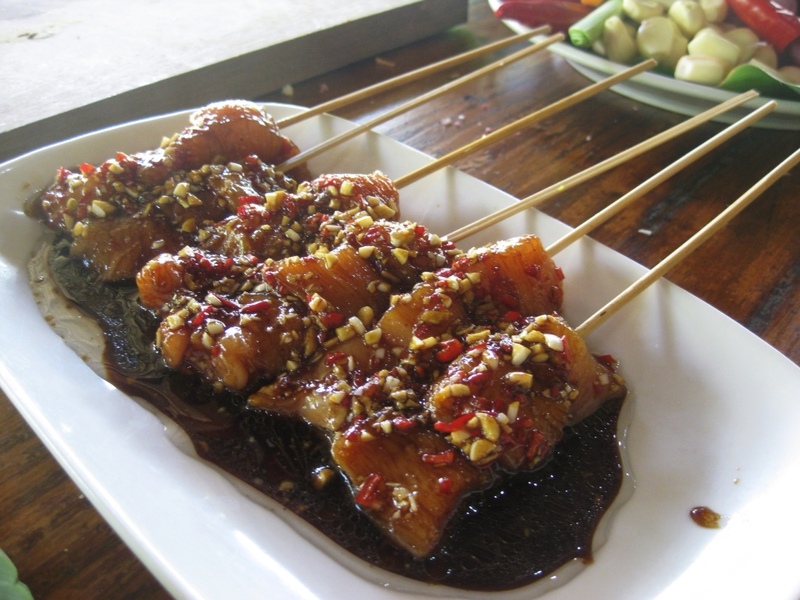 The result was delicious – a spicy, sweet sauce over flavorful and lightly charred chicken. On to Udang Campur, a prawn stir fry with tofu. This was the only “simple” dish of the day and the flavor was correspondingly straightforward. 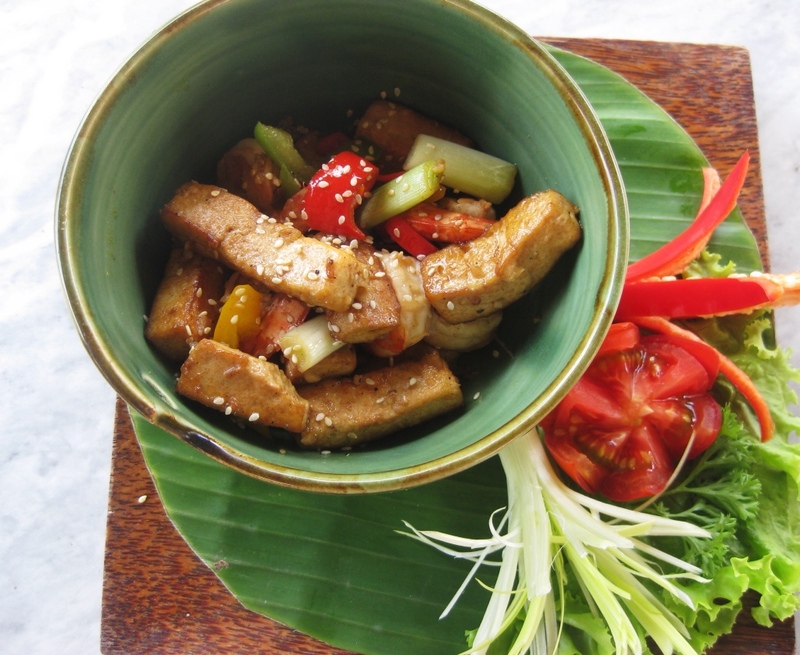 We pan fried strips of tofu and then stir fried them with the prawns, garlic, ginger, red green and yellow pepper, spring onion, chili, sesame oil and oyster sauce. 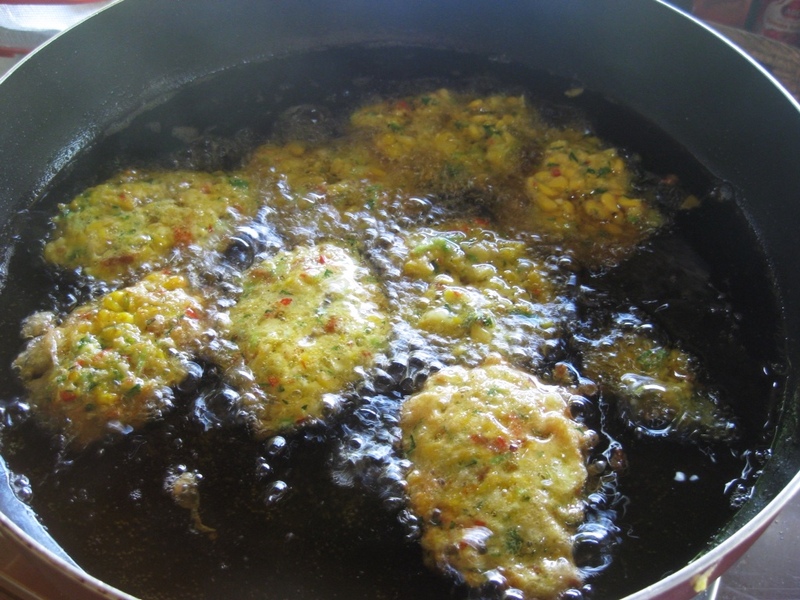 The most interesting dish of the day was Beregedel Jagung, or corn fritters. 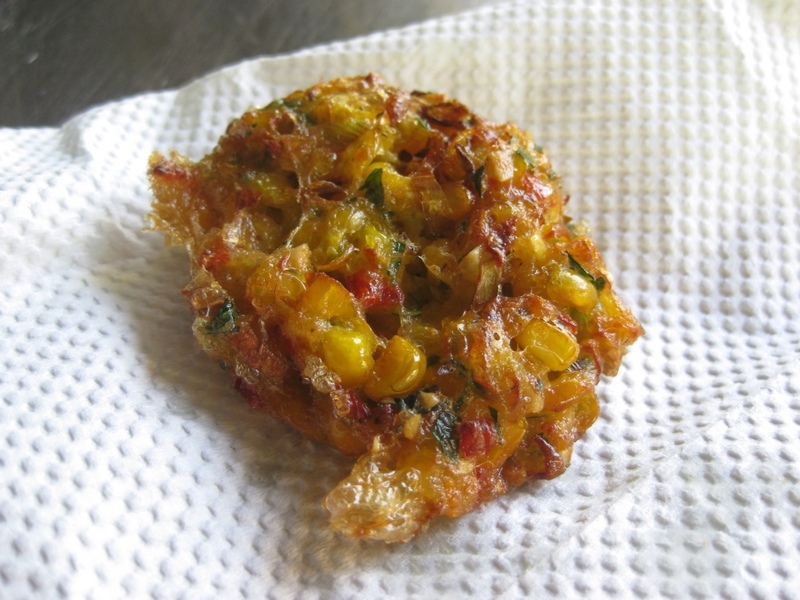 I am always looking for ways to use fresh corn in the summer and this is going to be a new addition to my repertoire. 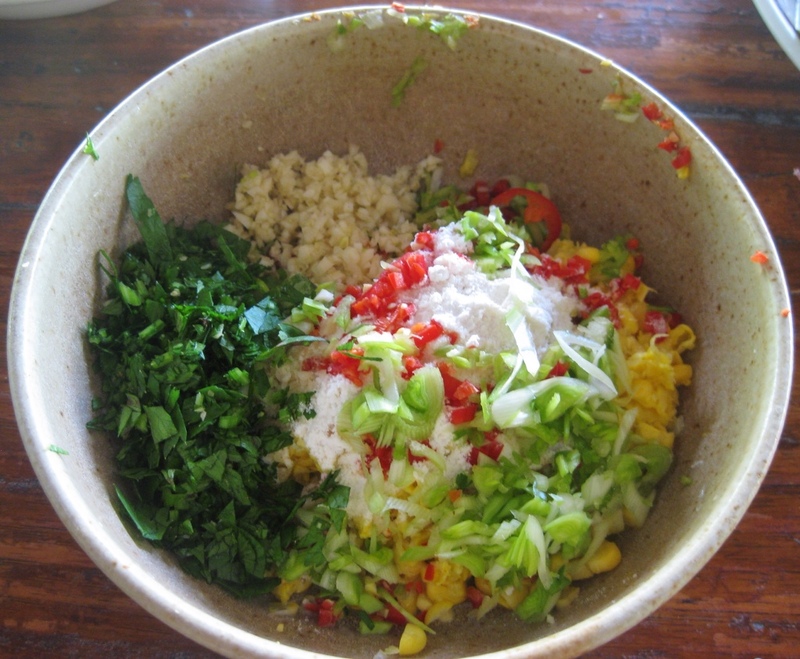 We cut corn kernels off the cob and mixed them together with minced spring onion, candlenut (like a macadamia nut), garlic, celery, chili, fried shallots, flour, and egg. We then tilted spoonfuls of the sticky mixture into a pan of boiling coconut oil until each little cake was an enticing golden brown color. Eaten hot from the skillet, they were bursting with the wonderful consistency that only something freshly fried can have. Dessert was Waluh Kukus, or steamed pumpkin and sticky rice. This dish requires multiple stages of steaming, which is done in a woven palm cone placed over a pot of boiling water. 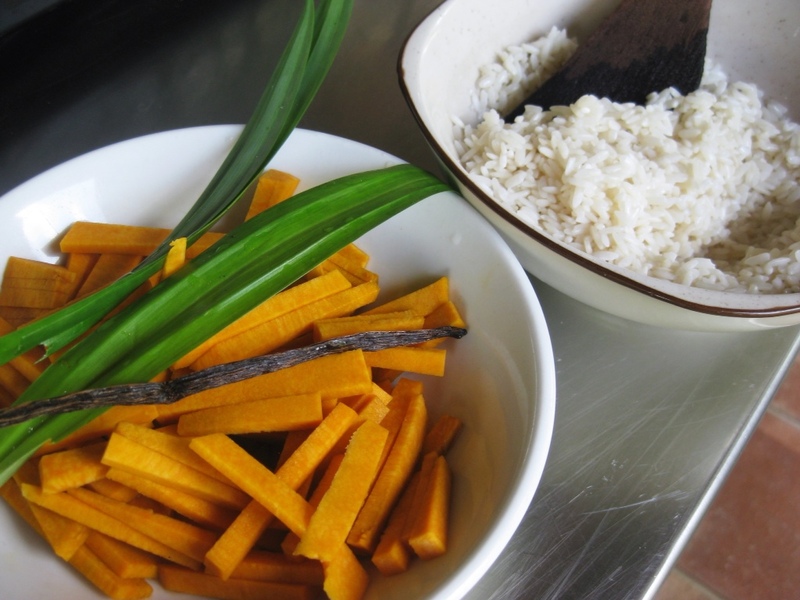 First we steamed the rice with vanilla beans and pandan leaf, which is an aromatic leaf used as a substitute in home cooking for the more expensive vanilla beans. 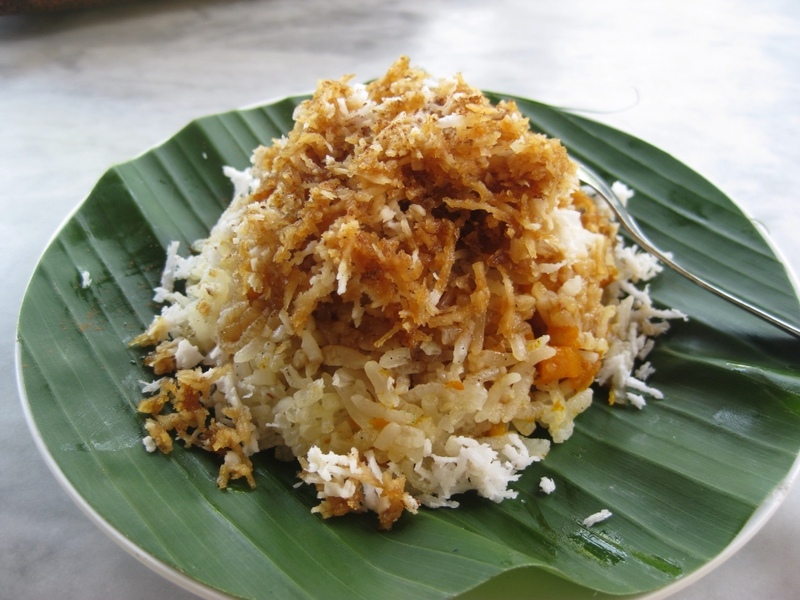 We then steamed pumpkin juliennes with the rice and then topped the dish off with shredded coconut and sweet palm syrup. The dish had a salty, sweet, and subtle flavor. A feast. Did I mention I was the only one in the class? 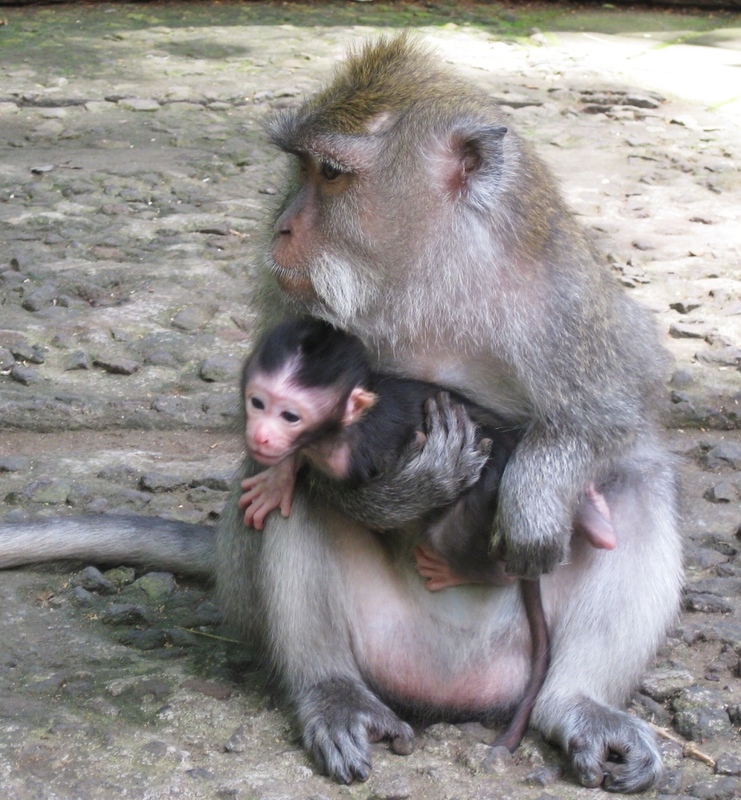 In an attempt to walk off some of my giant lunch, I wandered back to town through the Monkey Forest Sanctuary. 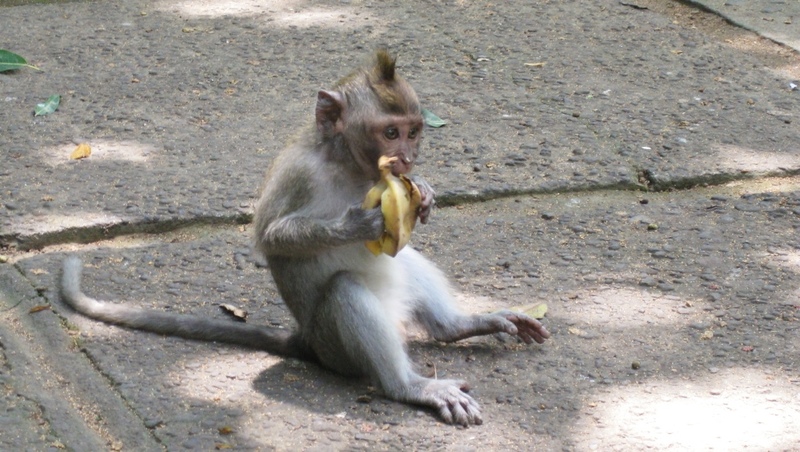 Monkeys of all ages roam freely, swinging from the trees, perching on statues of other monkeys, and most importantly, eating bananas that the tourists spoil them with. It was pretty amusing to watch someone hold a banana on his shoulder only to completely freak out when a few monkeys jumped him trying to get it. I watched scenes like this play out over and over again (tip: monkeys will climb up women’s long skirts; they will start to scream if the people near them start to scream; they will jump you if you hold food out and don’t surrender it quickly enough) and it was quite clear that the monkeys were running the show! 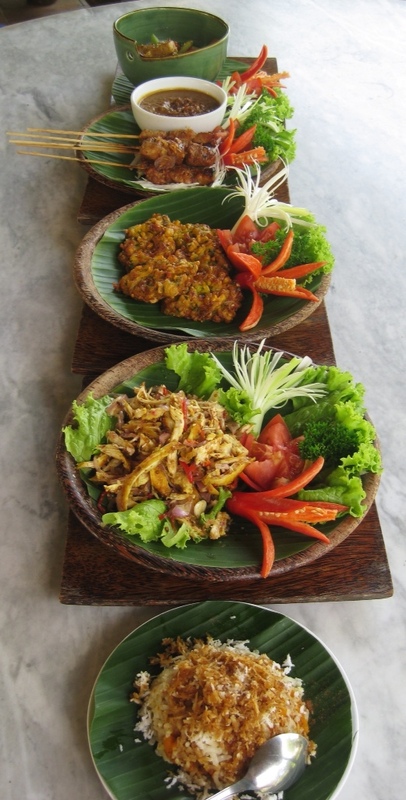 This entry was posted in Bali, Bali, Balinese, Indonesia, Indonesian, Ubud and tagged Ayam Panggang Sambal Matah, Bali, Balinese, Beregedel Jagung, Bumbu Kacang, Cafe Wayan, chicken salad, chicken satay, corn fritters, Indonesia, Indonesian, Laka Leke, Monkey Forest, Nasi Campur, peanut sauce, prawn stir fry, pumpkin sticky rice, Sate Ayam, Ubud, Udang Campur, Waluh Kukus. Bookmark the permalink.